Grimsby has Britain’s unhealthiest high street, a league table of the worst town centres across the country has revealed today. Streets with more fast food shops, bookmakers, tanning shops and off-licences score lower, while leisure centres, pharmacies and libraries improve the areas. Towns and cities in the north of England and the Midlands fared worst, with Northampton the furthest south in the list of the 10 unhealthiest. Meanwhile, those in the south, plus Edinburgh in the top spot, make up most of the UK’s top 10 healthiest high streets. 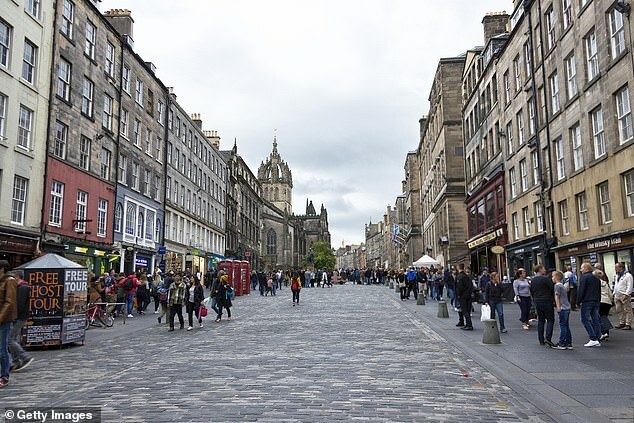 Experts say there should be more pressure to make sure high streets are healthier and ‘we shouldn’t underestimate how important the British high street is’. Health on the High Street, a report published today by the Royal Society for Public Health, has ranked 70 high streets across the UK. Behind Grimsby, shamed as the worst, come Walsall, Blackpool, Stoke-on-Trent, Sunderland, Northampton, Bolton, Wolverhampton, Huddersfield and Bradford. At the top of the table, behind Edinburgh, are Canterbury, Taunton, Shrewsbury, Cheltenham, York, Brighton, Eastbourne, Exeter and Cambridge. The high streets were rated by how many businesses they have which encourage healthy or unhealthy living, to give an overall score. And people living in the 10 healthiest areas live an average of two-and-a-half years longer than those with the unhealthiest high streets, the report found. The RSPH report also charts how high streets have changed in recent years – libraries and pubs are closing down, while fast food shops, vape shops and convenience stores are on the up. On average a new vape shop has opened every day since 2015, whereas 18 pubs are now closing each week in the UK. The number of payday lenders has dropped by a third since 2015 in the 70 studied towns and cities, and there are fewer betting shops nationwide than there were in 2012. Experts warn more deprived areas tend to have more shops encouraging unhealthy living, whereas the opposite is true of richer neighbourhoods. The report said 4,000 new fast food outlets have opened across the UK in the past five years – predominantly in poorer areas. Deprived areas now have five times more fast food shops than wealthy neighbourhoods. The research also showed that vape shops have doubled to 2,000 in the last three years. Shirley Cramer CBE, chief executive of the RSPH said: ‘Our rankings illustrate how unhealthy businesses concentrate in areas which already experience higher levels of deprivation, obesity and lower life expectancy. 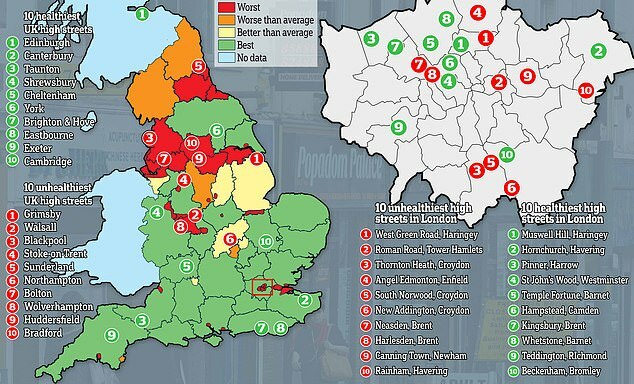 London‘s unhealthiest high streets have today been named – with one in Haringey being shamed as the worst in the capital. 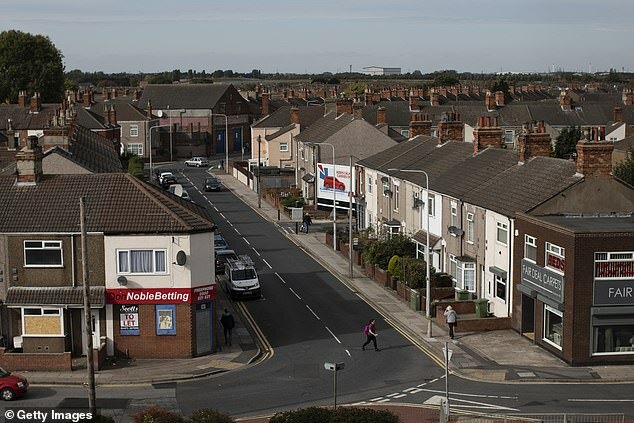 West Green Road was found to score worst in a league table of the streets with the most betting shops, takeaways, payday lenders, tanning shops and off-licences. At the other end of the scale of 146 high streets in London, Muswell Hill – also in Haringey just a few miles away – was listed as being the healthiest. Researchers found poorer areas tended to have more shops encouraging unhealthy living, whereas the opposite is true of richer neighbourhoods. Roman Road (West) in Tower Hamlets and Thornton Heath in Croydon were also named in the worst three offenders. South Norwood and New Addington, both in Croydon, placed fifth and sixth, while Angel Edmonton in Enfield ranked fourth. 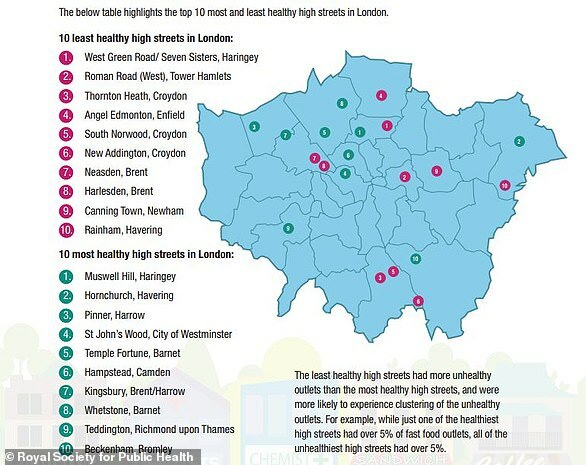 The rest of the top ten unhealthiest high streets in London were scattered around Brent, Newham and Havering. In contrast, Hornchurch in Havering was unearthed to be the second healthiest high street in the capital, followed by Pinner in Harrow. St John’s Wood in Westminster ranked fourth, pipping Temple Fortune in Barnet and Hampstead in Camden. Health on the High Street, a report published today by the Royal Society for Public Health, has ranked high streets across London. People living in areas with healthier high streets live longer than those surrounded by unhealthy shops. The difference in life expectancy between Muswell Hill and West Green Road, for example, is approximately four-and-a-half years, the Evening Standard reported. The RSPH’s rankings of towns and cities across the entire UK will be published tonight. SO, HOW DOES YOUR TOWN OR CITY RANK OVERALL?